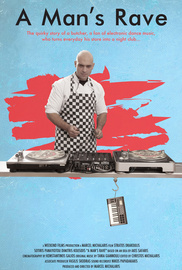 The quirky story of a butcher, a fan of electronic dance music, who turns his store into a night club...! A FEEL GOOD MOVIE about Music and Meat! Compulsion, obsession and passion may lead some people to creativity and to acts which at first glance may seem eccentric. One such character is Stratos, a 42 years old butcher who lives in Athens, Greece. Stratos' butcher shop is not an ordinary store where customers just go and buy meat, but rather a place where once you enter, it feels like you’re in a party of the early Rave scene. The loud music, the lights and the rhythms create an atmosphere that gives the butchery a totally new dimension. A feel good movie about the journey of everyday life and the escape from it.